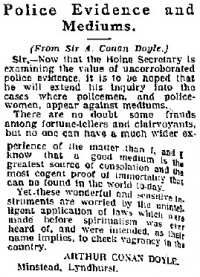 Police Evidence and Mediums is a letter written by Arthur Conan Doyle first published in the Daily Express No. 8562 on 6 october 1927. Sir, — Now that the Home Secretary is examining the value of uncorroborated police evidence, it is to be hoped that he will extend his inquiry into the cases where policemen, and policewomen, appear against mediums. There are no doubt some frauds among fortune-tellers and clairvoyants, but no one can have a much wider experience of the matter than I, and I know that a good medium greatest source of consolation and the most cogent proof of immortality that can be found in the world to-day. Yet, these wonderful and sensitive instruments are worried by the unintelligent application of laws which were made before spiritualism was ever heard of, and were intended, as their name implies, to check vagrancy in the country. This page was last edited on 21 July 2016, at 13:11.